"Tara, influencer marketing just doesn't work. I made a deal with the most influential person in this network and he posted his shining endorsement of my product and I got very little results." He lamented, "He has over 200,000 followers!" I asked him what else he did in the influencer's community to build up relationships and he looked at me sort of puzzled. He thought the relationships this influencer had would be enough to get the attention of the majority of his followers. "But they seem so engaged!" He added. Sure. They are probably very engaged...with the influencer dude. But that doesn't mean that they will jump on every little thing he writes about every company. I told my associate that I have over 45,000 followers on Twitter, but only a small portion of them joined up on Buyosphere...and it was MY COMPANY! I have relationships with various people who follow me for various reasons. Some of them liked my work on Coworking and early BarCamp days. Some of them started following me when I worked in San Francisco with Citizen Agency and our cool clients like Slideshare and Tripit and ran all sorts of 'web 2.0' events out of our awesome Citizen Space. Some discovered me through speaking, through my books and other writing and interviews. Others may just have happened upon me on a good day when I said something witty. Either way, I don't have the undivided attention of my 45,000+ followers. Every day, I build relationships within that audience and no amount of money can actually make those relationships transferrable. I'm not a fan of influencer marketing. I think it's lazy and short-sited. It's also highly unrealistic. We trust influencers. That's what made them influential in the first place, but we don't automatically trust their associates. And we can sniff out a paid endorsement a mile away. 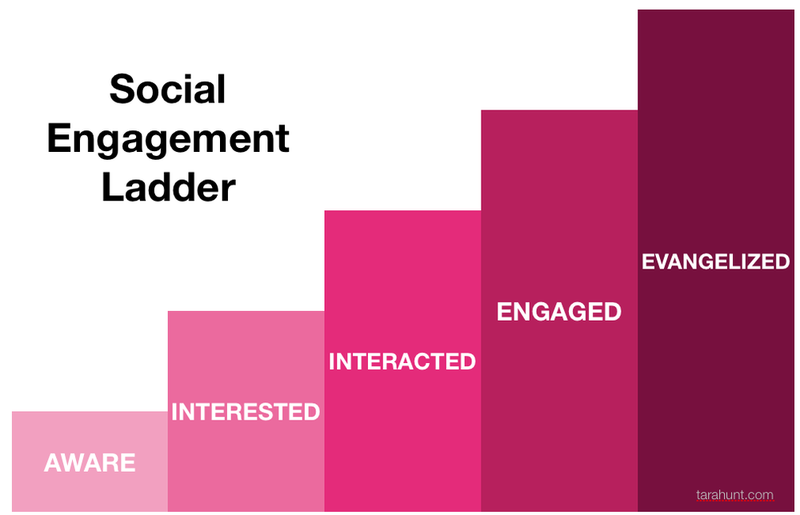 Each step of the Social Engagement Ladder respects the state of mind of the person whose attention you are trying to get and trying to skip steps will only lead to frustration. You wouldn't walk up to a person you've never met and expect them to marry you. You wouldn't ask a new friend to help you move. Social networks are built on relationships and even if they are online, they are still relationships. In fact, you probably need to be even more patient and take even more care because you don't always have those non-verbal cues to work off of. “I’ve seen you around” This is the stage where there is little to no brand awareness other than a quick glance. Sees a friend interact with your page on their FB feed. Comes across you in a search. Reads an article where you are mentioned. Heard a friend mention you in a conversation. Saw an ad for you or your product go by. Impress more of your current customers and keep getting the word out. Flash a nice smile. You aren’t even close to getting his/her attention. “I recognize you” Brand awareness is starting to build. People remember your name. Has seen a few friends interact with you on their FB feed. Sees you in several articles. Sees your ad pop up quite often. Has heard from more than one friend that they are using your service. Growing more aware, interest being piqued...but still apprehensive. Can be spooked/turned off. Brand awareness/interest, but no affinity. Approach cautiously, but in a friendly manner. No aggression. You catch his/her eye. He/she smiles back. Slowly make your move towards her/him. Think of something non-douchey to say. “I’ve checked you out” You have their attention. Not yet undivided. But you are moving in a great direction. Clicked one of the FB feed posts and checks out your page. Clicks on a link in one of those articles to check out your website. Asks a friend for more information and why he/she recommends you. Warming up and opening up to you and should be greeted with open arms. Greet customer with open arms. Listen a lot. Learn. Buy him/her a drink. Have a great conversation. Ask him/her to dance. Flirt. Time to ask him/her out for that coffee. “I’m hanging with you” This could be a very long stage, depending on the customer, your product and your moves. It's mostly your job to help them remember every single day why you are in their life and that you enhance it. If most of your customers linger here, great. It's a good place to be. Every day should be a day to remind that customer why they got this far with you. You are rockin this relationship. Don’t screw it up and take him/her for granted. Things are going very well. Coffee moved to dinner moved to drinks and so forth. Don’t screw it up and take him/her for granted. “You are the bomb!” OMFGBBQLOLYAY! This is a rare and beautiful stage. Heaven. Writing recommendations on social networks. Help make it easier for your customer to be your #1 fan. Thank them. So I told my associate that "influencer marketing" is a crock, but influence is real. It just can't be bought. It has to be earned. It takes finesse and empathy and all of that stuff that nobody can sell you or really even teach you.